The book and television series Game of Thrones has brought the mythical medieval world of kings and kingdoms back into the contemporary imagination. The world it depicts is a brutal world of despots and power-hungry individuals who will make any alliance to secure their way to the throne. While there are some characters who place the good of the realm over family or individual ambition, most of the characters are a despicable lot maniacally driven towards power. For those who hail from kingless countries, the language and images of kings and lords may seem at best outdated and the stuff of Arthurian legend, or at worst oppressive. Dominant images of kings and kingdoms as overlords, like those portrayed in Game of Thrones, conjure up images of tyrants living in ancient feudal societies who will stop at nothing and not think twice about stepping over anyone who gets in their way. As a result, for some the word “king” can hold fairly negative images and feelings. 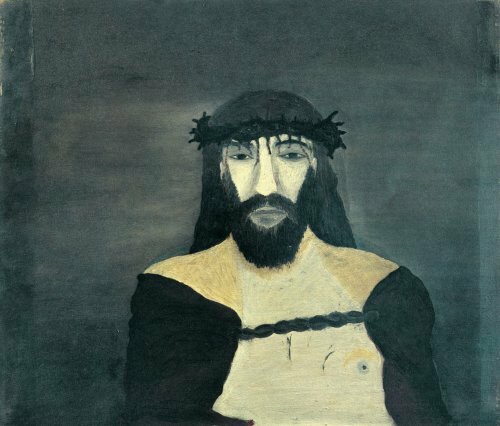 Horace Pippin, Christ Crowned with Thorns, oil on canvas, 1938, The Philadelphia Museum of Art. Jesus argued before Pilate that his kingdom was not of this world. He understood all too well the popular images of kings and lords and he specifically sought to undermine them. Jesus demonstrated that as king and as ruler of all, he would be the servant of all. The birth of Jesus itself is an example of this. God the Son, King of all creation, humbled himself to become human, even sharing the ultimate fate of his would-be captive subjects: human death. For those who care to see and hear in a new way, the Christian gospel presents an entirely different kind of king than those who simply play the games of thrones. King Jesus ruled by becoming a subject and reigns by serving even those subjects who would reject him. Christ the King is one who emptied himself, one who took the form of a servant, one who came in the likeness of humans. It is this sort of king precisely who seems worthy of the accolade that one day all shall bow. (2) Isaiah 65:17, 25; Jeremiah 23:5-6.